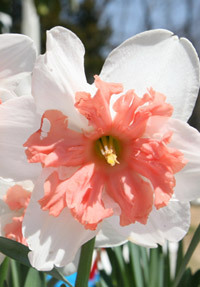 The Garden displays nearly 700 unique daffodil varieties, representing 12 of the 13 daffodil divisions along with a number of historic varieties and unique Missouri hybrids. The highest concentrations are in the Samuels and Heckman Bulb Gardens but many can also be viewed in the Shields Hosta Walk, Heckman Rock Garden, Cherbonnier English Woodland Garden and the Kemper Center for Home Gardening’s display gardens. 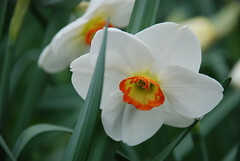 Many daffodils have also been planted in the Jenkins Daylily Garden and the Knolls. An April walk around the Missouri Botanical Garden will turn up clumps of daffodils in most every Garden area. Our collection is striking and noteworthy and in 2007, the American Daffodil Society recognized the Garden’s Narcissus collection as the first-ever ADS Daffodil Display Garden. The Garden's daffodil collection is largely overseen by the local Greater Saint Louis Daffodil Society.